Islamabad: Pakistan on Monday dismissed the US designating Hizbul Mujahideen chief Syed Salahuddin a “global terrorist”, saying it was not a UN decision but a move by the Trump administration to “appease” India. Alleging that India was offering its services to the US to “pressurise” China, Pakistan Prime Minister’s Adviser on Foreign Affairs Sartaj Aziz said India has been trying to downplay the Kashmir issue for a very long time. 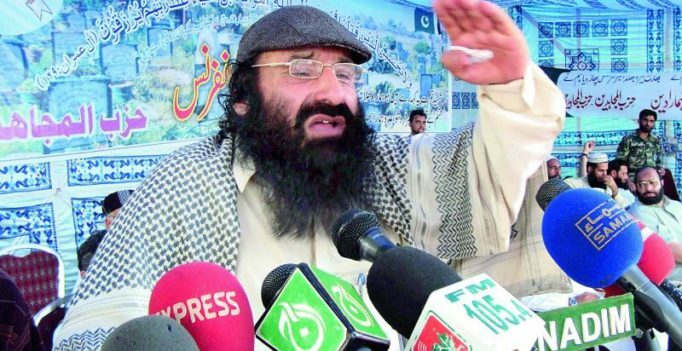 Talking to a delegation from the Kashmir Journalists Forum, he said Salahuddin being designated a terrorist by the US was an attempt by the American administration to “appease” India. Pakistan was not bound to follow the decision as it was not a United Nations (UN) declaration, Dawn newspaper quoted Aziz as saying. The US declared Salahuddin a “global terrorist” just before Prime Minister Narendra Modis first meeting with President Donald Trump on June 26 in Washington. Aziz said that India has been trying to downplay the Kashmir issue for a very long time, but the agitation at the local level had completely changed the Indian narrative. Aziz reiterated that the struggle was being led by Kashmiris and Pakistan was only providing political, diplomatic and moral support to them. Aziz also highlighted ceasefire violations by India, claiming that India had violated the ceasefire more than 400 times in the past years, which was a violation of a 2003 agreement between the two nations. He said that Pakistan was willing for a dialogue on all issues with neighbouring countries as a part of its vision for a peaceful neighbourhood, but a dialogue with India without Kashmir on the agenda was out of the question. Snapped: Harshvardhan Kapoor and Sara Ali Khan at Kareena-Saif’s; film together?